It’s finally cooler in Florida now and all I can think about is warm soups and lots of hot tea and coffee. 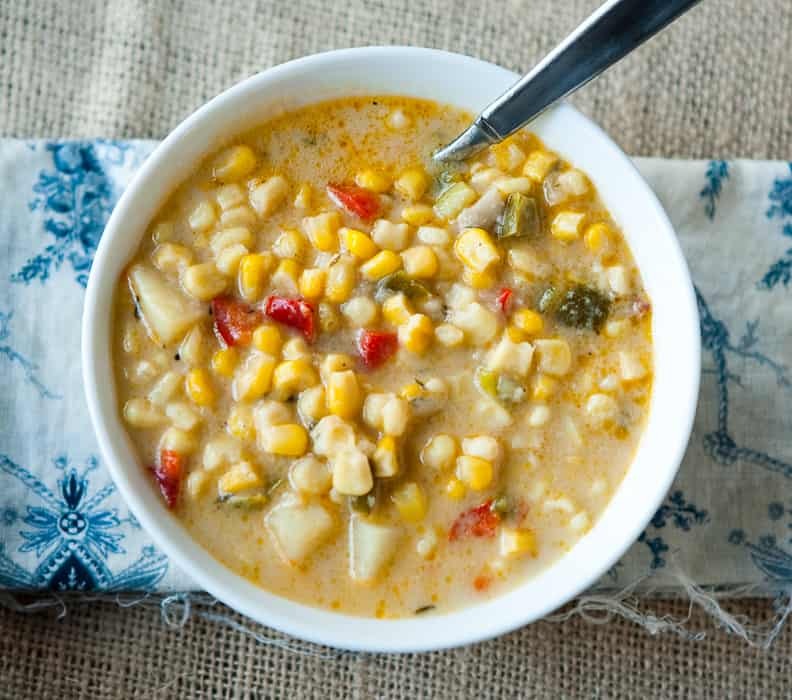 For this soup, I wanted a little taste of summer in a winter soup, so I made this corn chowder with sweet frozen corn. I used a mixture of sweet yellow and white corn along with red and green peppers and lots of smoky bacon. This isn’t only a delicious chowder, but it’s also very economical. It’s very filling, and you can make a ton of it without spending alot. This soup was also featured on Tablespoon.com, along with 3 more amazing soup recipes I will be sharing very soon! Preheat a large soup pot. Add bacon and cook until it renders it's fat. Add onions, red pepper, and green peppers. Cook until tender crisp. Add white and yellow corn, diced potato, milk and thyme. Add salt and pepper. Bring to a boil and reduce to a simmer. Simmer for 30 – 40 minutes, or until potatoes are very tender. We woke up to falling snow this morning and all I could think of was soup. This would hit the spot perfectly! 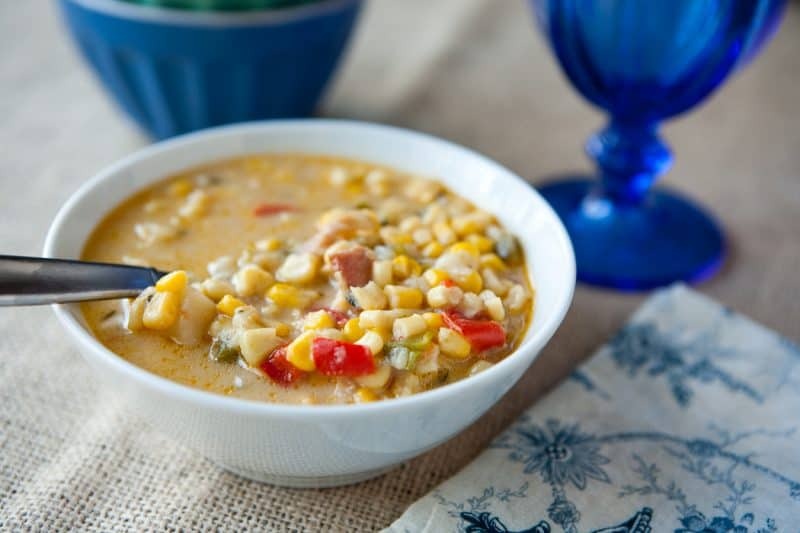 So nice to see a chowder you can make with frozen corn, as it’s way out of corn season here in New England. That is one gorgeous bowl of soup, and with this weather, could DEFINITELY use it! So easy and delicious! I’ve got to add this to my list of “It’s 5:00, what’s for dinner?” recipes. A nice, hearty chowder especially for my upcoming ski weeks! Where can I find this recipe? It looks delish!!! No worries!! I thought I was going crazy! Lol. Definitely will be making this! Thank you. 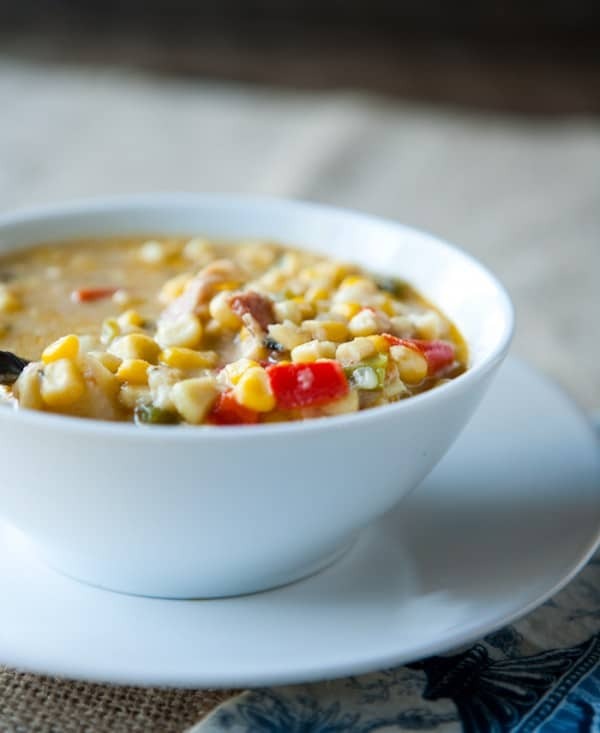 A nice bowl of corn chowder is the ultimate way to warm up on a cold day. Just looking at that bowl of chowder makes me all warm and cozy inside. I can imagine how mush better I would feel to have it in my tummy!